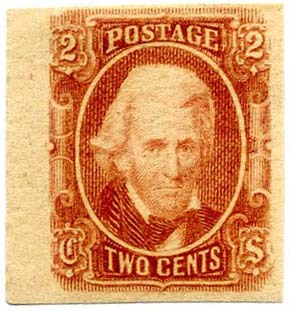 There are two printings of the 2¢ intaglio (engraved) stamp which can be scientifically identified by paper type. 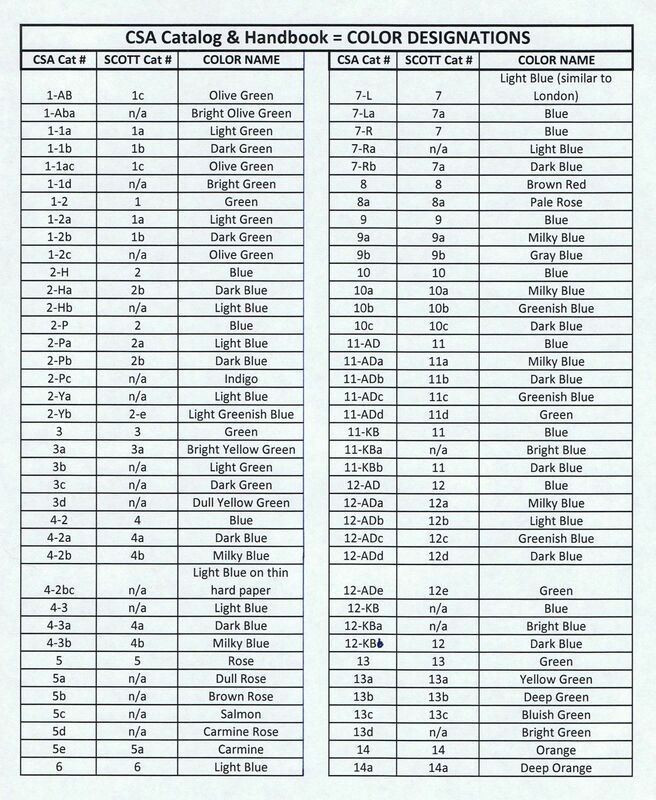 Many of the stamps offered here come with Certificates of Analysis by Harry G. Brittain, PhD, FRSC, Center for Pharmaceutical Physics. 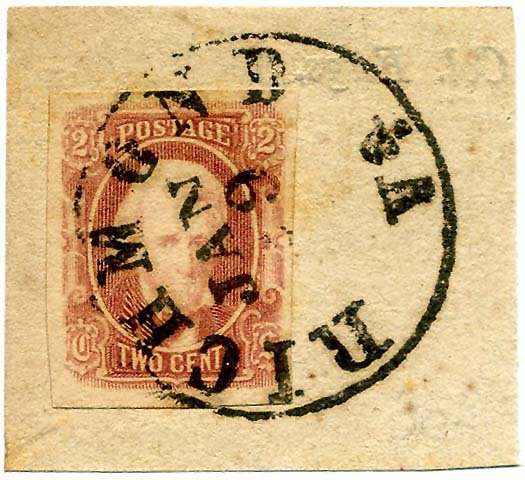 Dr. Brittain has published ground breaking research on papers and inks in The Confederate Philatelist, quarterly journal of the Confederate Stamp Alliance (July-Sept 2013 issue). 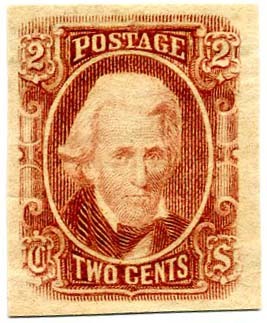 The Brittain Certificates only address whether stamps are from the First (usually pale red) or Second (usually brown red) Printing. 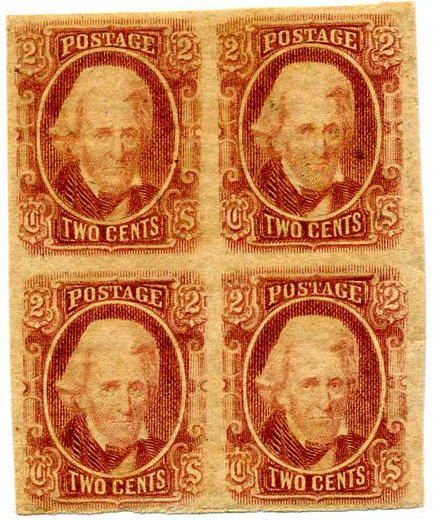 CSA 8 variety, Second Printing, 2¢ deep brown red block of 4, deep rich color, full original gum, light hinge remnant; minor double transfers at bottom of bottom two stamps. Ex Clippert, SCV as block $375; 2012 Brittain certificate. $400. 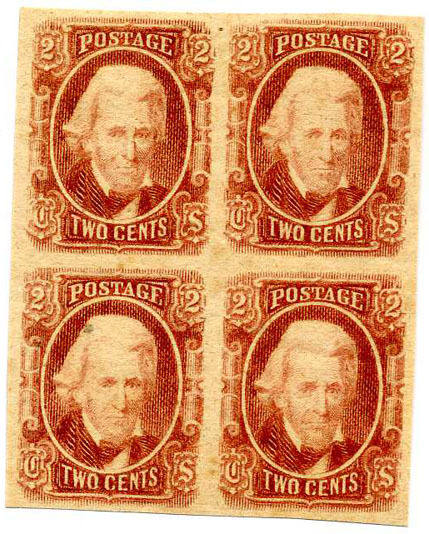 CSA Catalog 8-v3, Second Printing, 2¢ brown red, with margins all around and clear DOUBLE TRANSFER in "TWO CENTS," original gum, lightly hinged, Extremely Fine, Brittain certificate. 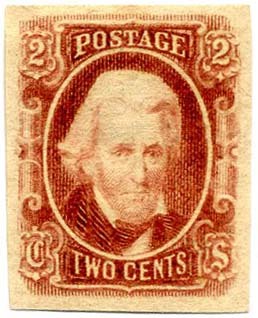 CCV $200. $200. 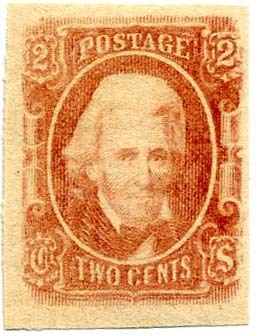 CSA 8, Second Printing, 2¢ brown red used with Richmond, Va. Apr 1 cds, small thin otherwise Fine. SCV $350. 2012 Brittain certificate. $290. 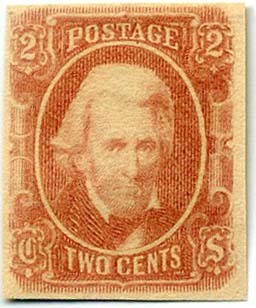 CSA 8, Second Printing, 2¢ brown red used with Richmond, Va. JUN 11 cds, rich color. SCV $350. 2012 Brittain certificate. $300. 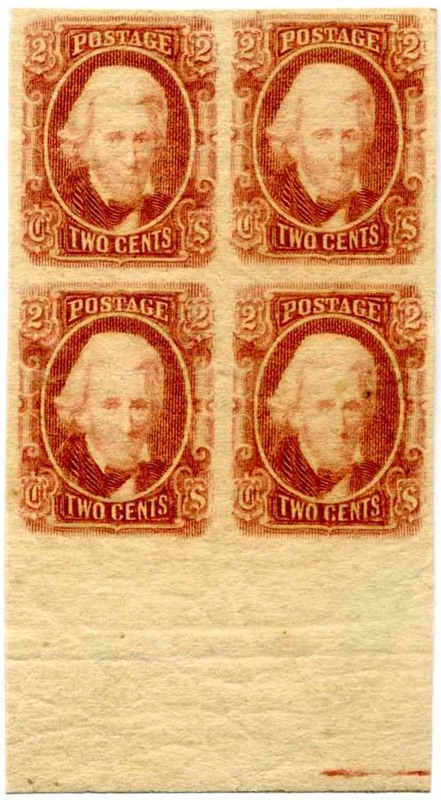 CSA 8, Second Printing, 2¢ brown red block of four, original gum, lightly hinged, Very Fine, SCV $375. 2012 Brittain certificate. $400. 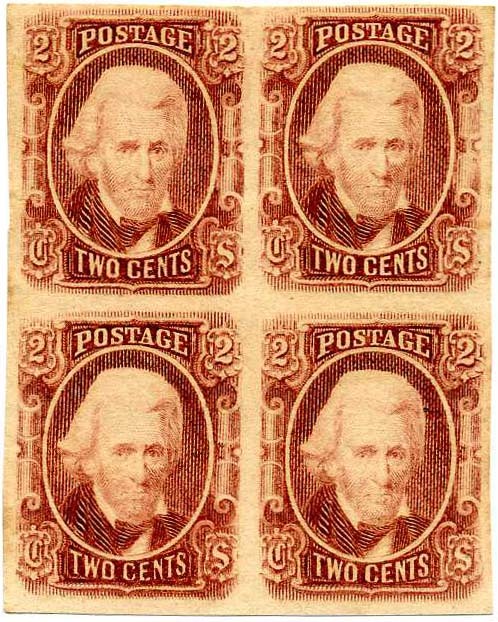 CSA 8, Second Printing, 2¢ red brown block of four, original gum, never hinged, Very Fine, SCV $375. 2012 Brittain certificate. $475. 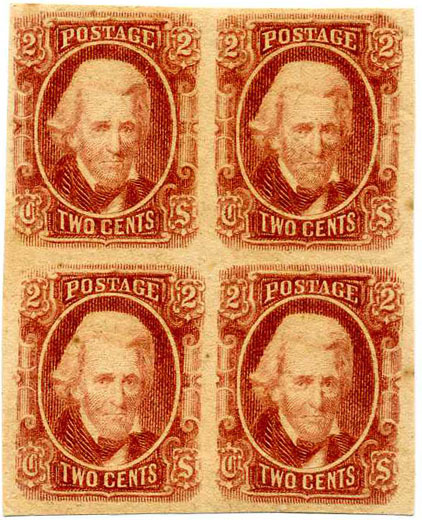 CSA 8, Second Printing, 2¢ red brown block of four, original gum, very lightly hinged, Very Fine, SCV $375. 2012 Brittain certificate. $425. 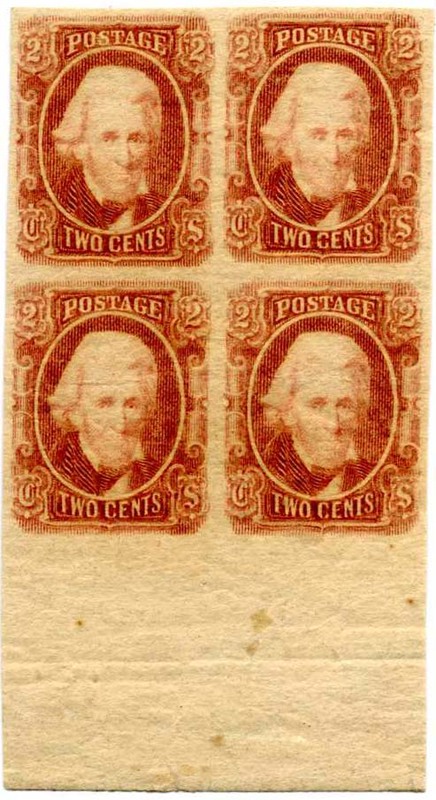 CSA 8, Second Printing, 2¢ brown red block of four, original gum, very lightly hinged, Very Fine, Choice, SCV $375. 2012 Brittain certificate. $350. 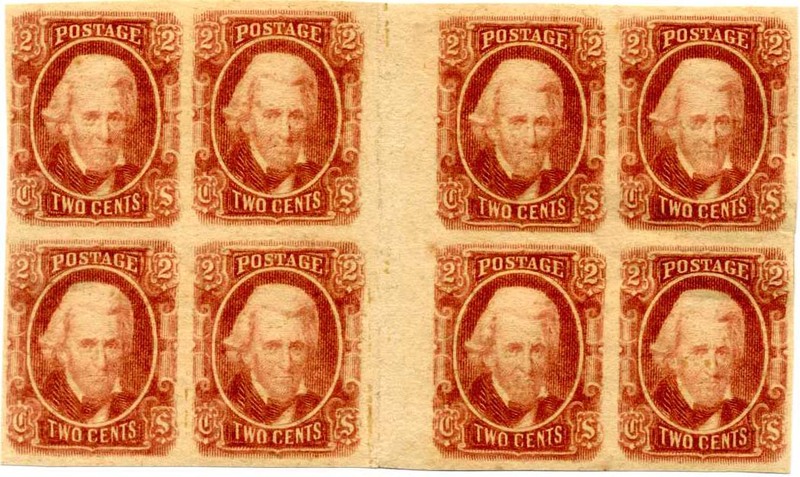 CSA 8, Second Printing, 2¢ brown red gutter block of 8, original gum, gutter pairs are never hinged with hinge remnants on pairs at the sides, P.O. 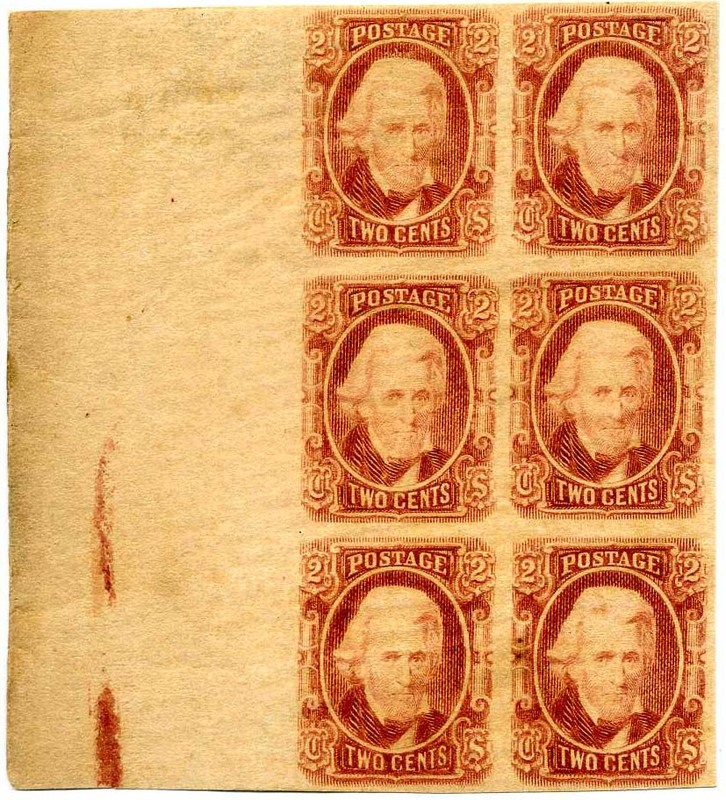 crease down the gutter as usual, a lovely rare block, Brittain certificate, SCV $970+. $1,000. 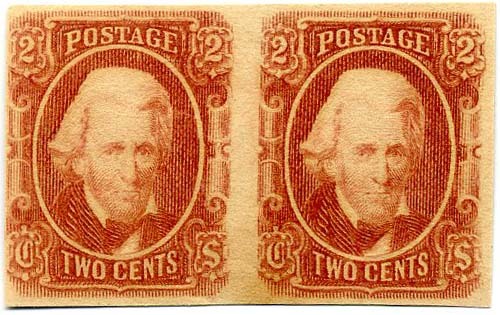 CSA 8, Second Printing, 2¢ brown red pair canceled by Richmond, Va. town cancel, 1976 PF Certificate for strip of four #8, SCV $1,000.+ 2012 Brittain certificate. $800. 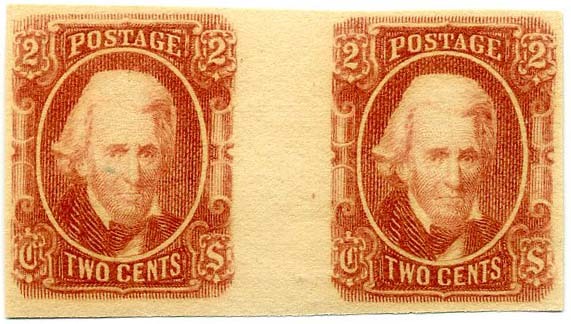 CSA 8a, First printing, 2¢ pale red used pair canceled by overlapping strikes of Richmond, Va. town cancel, 2002 CSA Certificate #04160, small tear at right edge of right stamp, light crease on left stamp, Extremely Fine appearance, Rare shade / use, SCV $1,000.++ Pretty! 2012 Brittain certificate. $1,000. 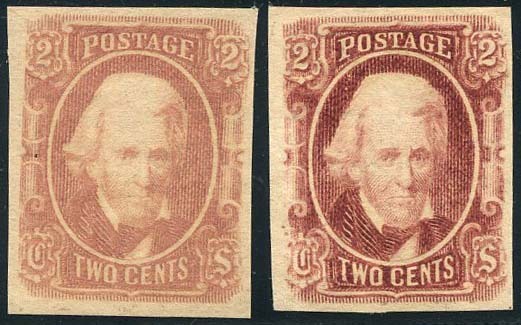 CSA 8, Second Printing, 2¢ brown red pair, nice color, full slightly disturbed original gum, Very Fine. SCV $160. 2012 Brittain certificate. $130. 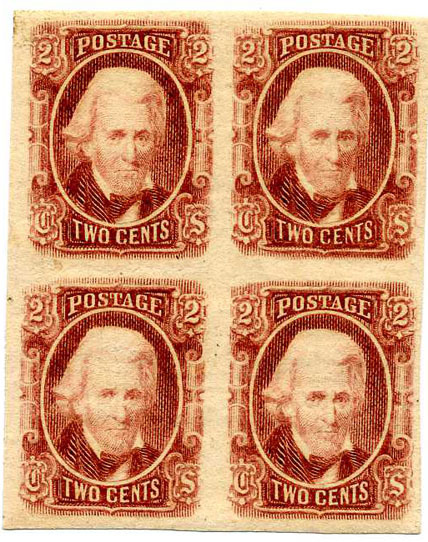 CSA 8, Second Printing, 2¢ brown red lower left corner margin block of four, full original gum, very lightly hinged, Very Fine, SCV $375.+ 2012 Brittain certificate. $400. 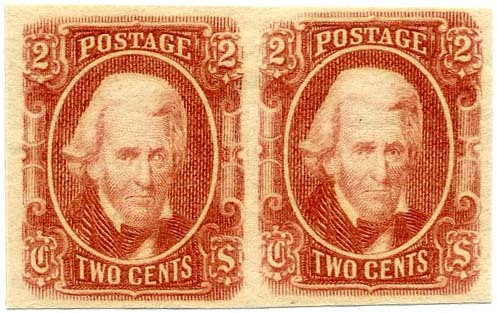 CSA 8 variety, Second Printing, 2¢ brown red right sheet margin pair, left stamp with Double Transfer in “POSTAGE” and “2”, Positions 59-60R, full original gum, left stamp very lightly hinged, right stamp never hinged, usual gum wrinkles, SCV $205.+ 2012 Brittain certificate. $350. 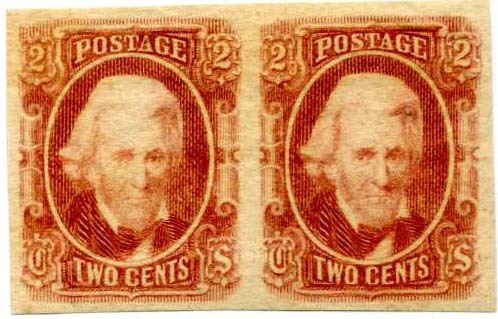 CSA 8 variety, Second Printing, 2¢ brown red right sheet margin pair, left stamp with Double Transfer in “POSTAGE” and “2”, Positions 59-60R, no gum, penciled “shift” written in margin by old time collector or dealer, SCV $205.+ 2012 Brittain certificate. $150. 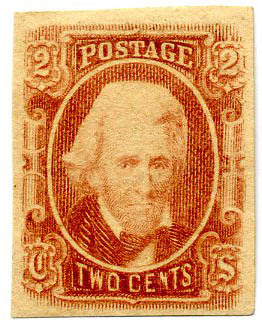 CSA Catalog 8-v5, Second Printing, 2¢ brown red with Double Transfer in “POSTAGE” and “TWO CENTS” and “2”, position 92L, no gum, bit soiled. 2012 Brittain certificate. CCV $350. for the variety. $200. 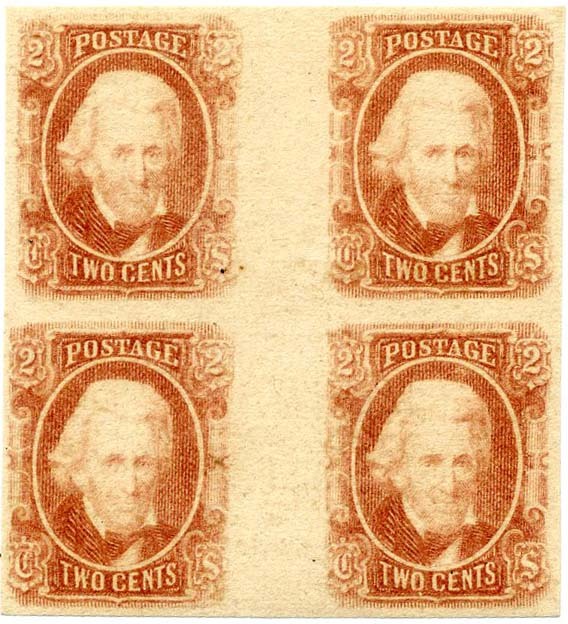 CSA 8, Second Printing, 2¢ brown red bottom sheet margin block of 4, full original gum, never hinged / very lightly hinged with a couple of tiny thins, SCV $375.+ 2012 Brittain certificate. $250. 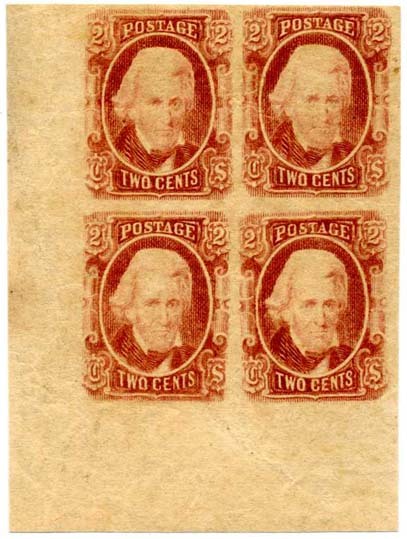 CSA 8, Second Printing, 2¢ brown bottom sheet margin block of 4, full original gum, very lightly hinged with a bit of gum crazing, SCV $375.+ 2012 Brittain certificate. $300. 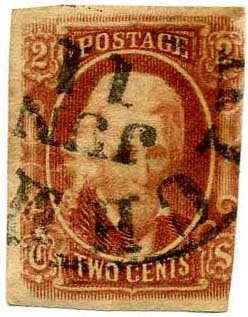 CSA 8a, First Printing, 2¢ pale red, original gum, heavy hinge remnant causing paper bend, SCV $90. 2012 Brittain certificate. $50. 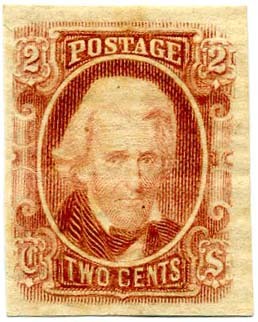 CSA 8, First Printing, 2¢ pale red right right sheet margin, traces of gum, SCV $100.+ 2012 Brittain certificate. $90. 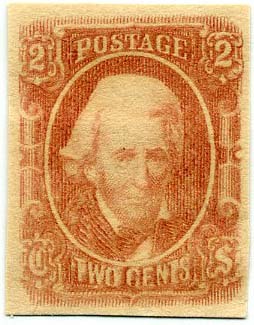 CSA 8, First Printing, 2¢ pale red right right sheet margin, traces of gum, SCV $90.+ 2012 Brittain certificate. $90. 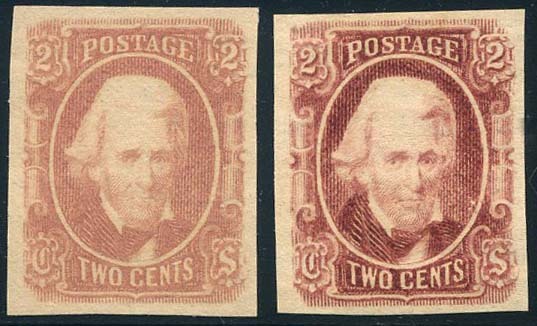 CSA 8a, First Printing, 2¢ pale rose with DOUBLE TRANSFER in "TWO CENTS" - CSA Catalog variety 8-v3; full original gum, very lightly hinged; 1988 PF Certificate for strip of 4 from which it came, 2012 Brittain certificate for a pair as First Printing. CCV $200.+ with no regard for the scarcer shade. $230. 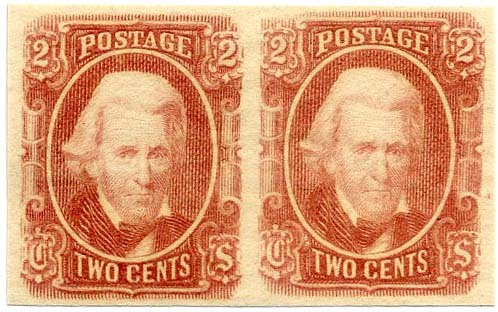 CSA 8a, First Printing, 2¢ pale red, original gum, never hinged, Very Fine, SCV $90+ 2012 Brittain certificate. $120. 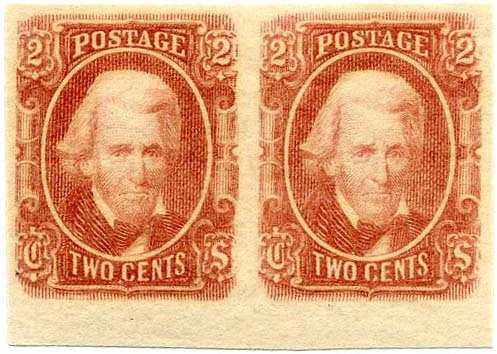 CSA 8, Second Printing, 2¢ brown red left sheet margin pair, full original gum, original gum, very lightly hinged, Very Fine, 2012 Brittain Certificate as to printing state, 2013 PF Certificate. SCV $160. $230. 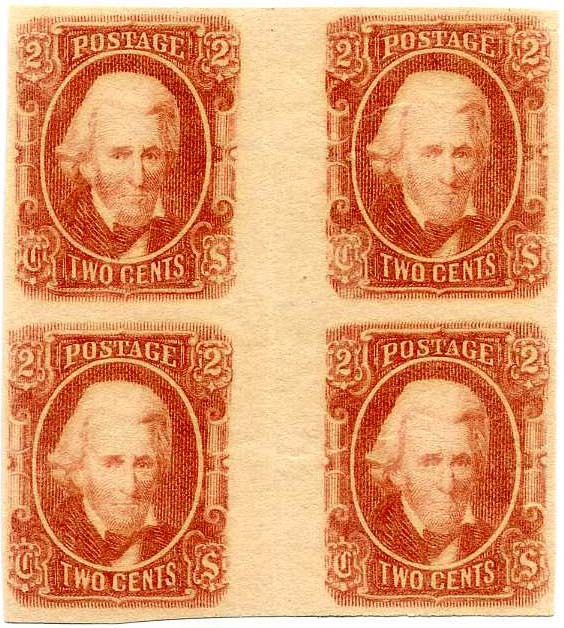 CSA 8, Second Printing, 2¢ brown red left sheet margin block of 6, full original gum, some light creasing, 2 heavy hinge remnants mostly in margins, SCV $535. $400. 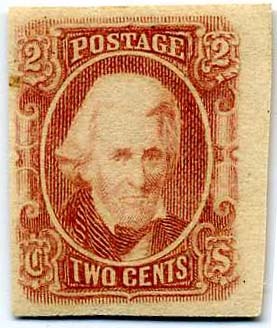 CSA 8a, First Printing, 2¢ pale red, huge margins with faintest gum bend, original gum, very lightly hinged, Extremely Fine, SCV $90. $150. 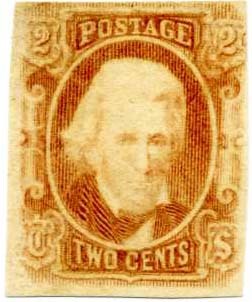 CSA 8a, First Printing, 2¢ pale red, faint gum bend, original gum, hinge remnant, Very Fine, SCV $90. $80. 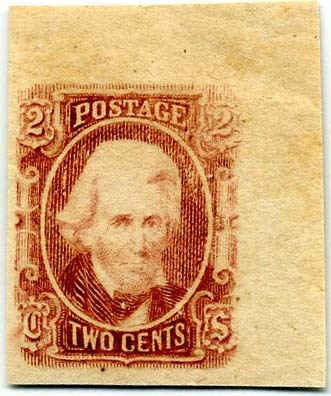 CSA 8, Second Printing, 2¢ brown red left sheet margin, original gum, light hinge remnant, Very Fine. SCV $85+ $95. 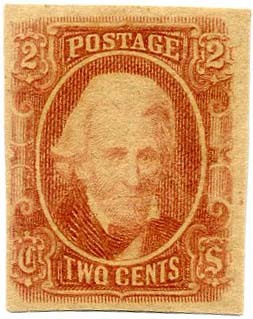 CSA 8, Second Printing,2¢ brown red pair, original gum, tiny thin on left stamp, light hinge remnant, fresh, nice color. SCV $160. $85. 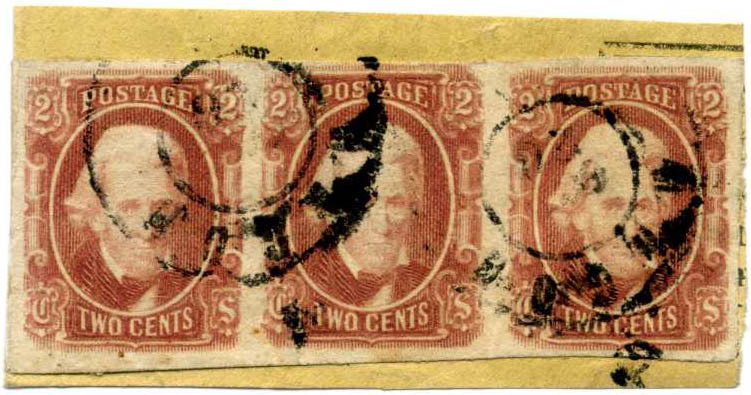 CSA 8a, First Printing, 2¢ pale red, full original gum, lightly hinge remnant, Extremely Fine. SCV $90. $140. 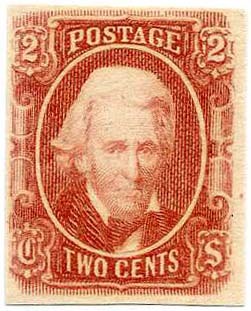 CSA 8a, First Printing, 2¢ pale red GUTTER PAIR, original gum, never hinged, Extremely Fine, SCV as regular shade (second printing) $325. $450. 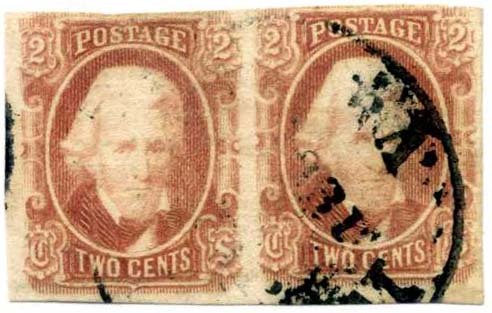 CSA 8a, First Printing, 2¢ pale red pair, full original gum, very lightly hinged, Fine-Very Fine $160. 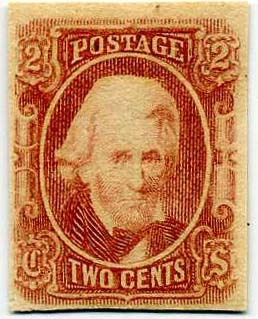 CSA 8a, First Printing, 2¢ pale red, full original gum, very lightly hinged, Fine-Very Fine. $80. 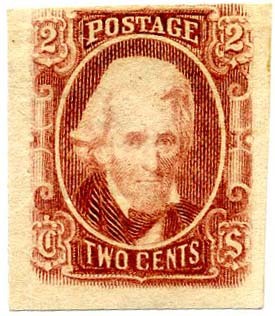 CSA 8a, First Printing, 2¢ pale-red, unused, full original gum, small owner backstamp, Fine-Very Fine, SCV $90. $80. 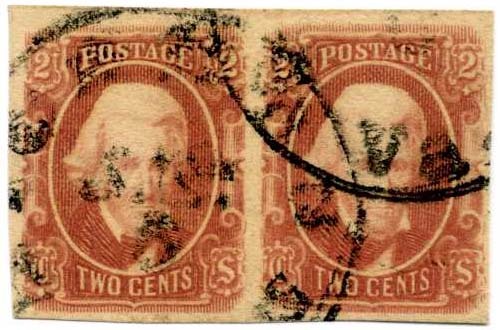 CSA 8a, First Printing, 2¢ pale red pair, original gum, never hinged, Very Fine+, SCV $180 as singles. $240. 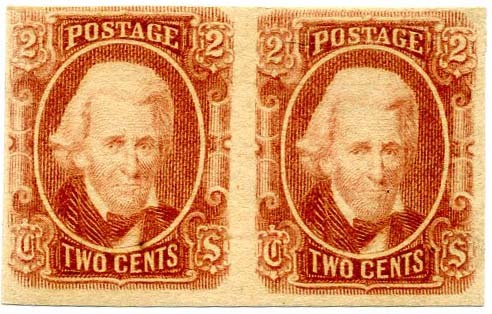 CSA 8a, First Printing, 2¢ pale red bottom sheet margin pair, original gum, never hinged, Extremely Fine, SCV $180 as singles. $300. 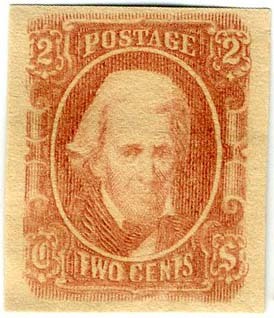 CSA 8, Second Printing, 2¢ brown-red with DOUBLE TRANSFER at bottom edge, fresh, good color, original gum, vertical creasing at edge. $140. 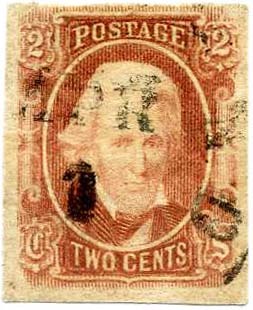 CSA 8a, First Printing, 2¢ pale red GUTTER BLOCK OF 4, no gum, SCV $650. $300. 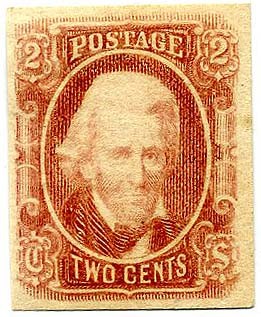 CSA 8a, 2¢ pale red, First Printing, original gum, never hinged, rich color, Very Fine-Extremely Fine, Choice. SCV $90. $150. 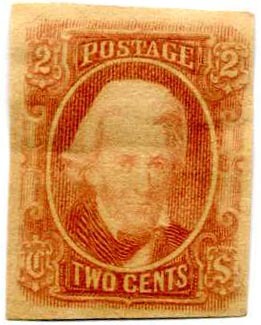 CSA 8, Second Printing, 2¢ brown red, full original gum, characteristic gum ripples, never hinged, slight DOUBLE TRANSFER in “TWO CENTS,” Ex Clippert, SCV $75 for single, SCV $130 for double transfer, CCV $200 for DT, Fine-Very Fine. $140. 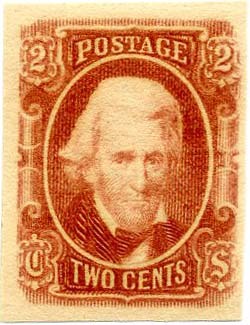 CSA 8, Second Printing, 2¢ brown red, original gum, lightly hinged, SCV $75. $75. 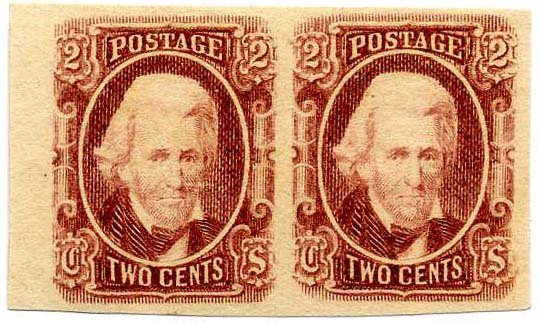 CSA 8, 2¢ brown red used with CHARLESTON / S.C. // Paid cds, with photocopy of 1981 PF certificate for the strip of 3 from which this is the right stamp. $300. 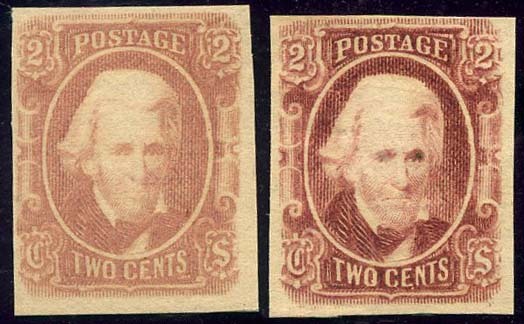 CSA 8a and CSA 8, First and Second Printings, 2¢ pale red (traces original gum, Ex Kaplan) and 2¢ brown red (original gum, bit disturbed), PRISTINE SET, Extremely Fine. SCV $165. $250. 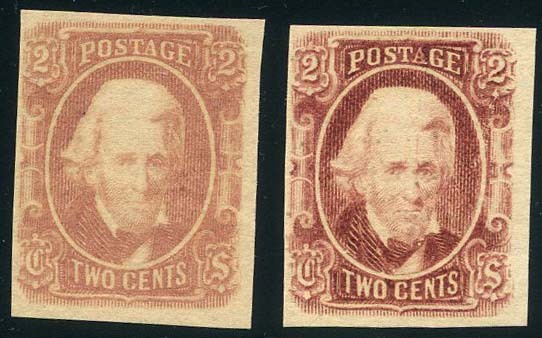 CSA 8a and CSA 8, First and Second Printings, 2¢ pale red (traces original gum, Ex Kaplan) and 2¢ brown red (original gum, bit disturbed), PRISTINE SET, Very Fine. SCV $165. $170. 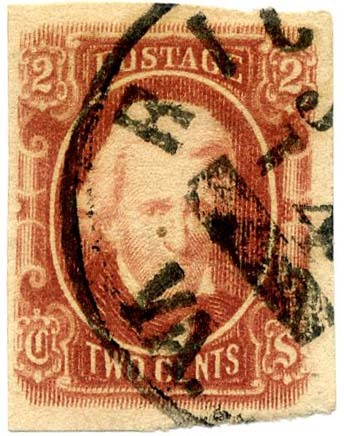 CSA 8a and CSA 8, First and Second Printings, 2¢ pale red (traces original gum, Ex Kaplan) and 2¢ brown red (original gum, bit disturbed), black inclusion speck in eye of #8 otherwise Very Fine. SCV $165. $150. 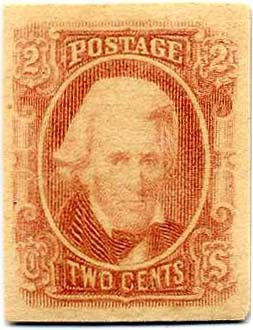 CSA 8, Second Printing, 2¢ brown red, rich color, ample to large margins all around, bold RICHMOND / Va. cds, small internal crease, SCV $350. $350. 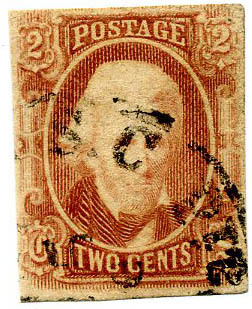 CSA 8, Second Printing, 2¢ brown red with 4 large balanced margins, original gum, heavy hinge remnants, Extremely Fine. $95. 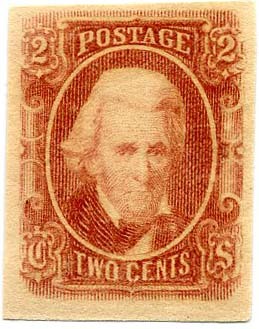 CSA 8, 2¢ brown red with large even margins, tied to small piece by bold RICHMOND/ Va. // JAN / 9 CDS, small faint toning spots barely affect the stamp when viewed under magnification, Extremely Fine appearance, 2015 PSE certificate, SCV $350. $350.